Reprint. Reading level guidance book band: 6 orange. Originally published: 2018. This funny, charming story is the perfect way to introduce young children to being polite, and help them understand the importance of using nice manners. Also included are suggestions for activities and ideas to talk through together to help children fully understand how their behaviour can impact on others. Rhino does not have very nice manners, especially at the dinner table. But soon no one wants to sit near him at lunch time and he even misses out on tea at his friend's house. 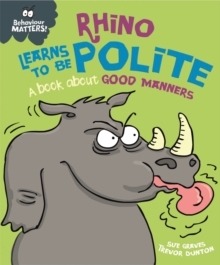 It is time for Rhino to bring out his very best manners!The Behaviour Matters series of picture books provide a gentle means of discussing emotions, boosting self-esteem and reinforcing good behaviour. Supports the Personal, Social and Emotional Development Area of Learning in the Early Years Foundation Stage, and is also suitable for use with children in KS1 and can be used to discuss values. Suitable for children under 5.